Did you know that your credit card can be canceled or your credit card rates hiked because you stumble elsewhere? Bob and Louise Elmore (not their real names) can testify to that. Retired and living on a fixed income, they were experiencing strain and frustration in their financial life. Louise had sacrificed their lake house to pay off her credit cards. Their lives turned completely upside down when Bob fell at work and was not allowed to return. Louise knew she only wanted to keep a couple of credit cards. She contacted the other card companies and was accepted into their various hardship programs. Hardship programs are available by request from most credit card companies and the late charges and other fees will stop if negotiated payments are made. The Elmores even received several late-charge refunds, including three on one account. Once the settlement on their lake house was in the bank, Louise made sure she completely paid off the other credit card companies. Everything seemed to be settling down for the Elmores until Louise received a notice in the mail that the one card she planned to keep, Iberiabank, was canceling her account. What? There was never a late payment, nor an over-the-limit use of her card. Why…why…why? Louise got in touch with the consumer credit department at Iberiabank. The credit rep told her the bank had seen problems on her credit reports reflecting her difficulties with her other lines of credit and had decided she had become a bad risk. 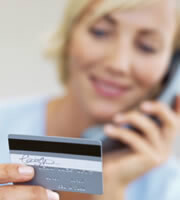 Therefore, they had canceled her card under the universal default terms of her credit agreement. Universal default is when a card issuer raises interest rates on a client based on that customer's behavior on another, unrelated loan or credit account. Even a late utility bill can trigger higher credit card rates through universal default. In this case, the punishment was much more severe, as Louise's card was canceled outright -- a strong penalty triggered by a fine-print clause in their contract. Fortunately, the Elmores' story has a happy ending. Officers of Iberiabank were contacted and the situation explained. The fact that the Elmores maintained their checking account, savings account and credit card account at the same bank can sometimes be a flag for more internal audits. On the other hand, this multiple banking account relationship was helpful, and their account was reopened with a lower line of credit. The Elmores' lengthy credit history with this particular credit card was restored. As long as they continue to demonstrate responsibility, Bob and Louise will be able to up their limits if needed. Wasn't universal default covered in the CARD Act? The CARD Act, which became effective in February 2010, was supposed to eliminate universal default, wasn't it? Well, partly. According to Lauren Bowne, staff attorney for Consumers Union, "universal default is only over with respect to retroactive increases." Bowne points out that under the major provisions of the CARD Act, your credit issuer cannot raise interest rates on existing balances unless you are 60 days late with your payments. Bowne states that consumers were harmed most by the retroactive nature of raising rates on credit card balances. So, this part is a big win for you the consumer. But on future balances, going forward, your credit card rates can be raised for any reason. The only restriction is that 45 days' notice must be given before the rate is raised. You have to watch out because even though the notice must be sent 45 days in advance, the new, higher rate applies to purchases made 14 days after the notice has been sent. Therefore, you need to stop using the card within two weeks if you don't want to pay higher rates. Consumer Action, a nonprofit credit education organization, in their 2008 credit card survey, listed worsening credit scores, paying another creditor late, and too much debt as some of the factors used by issuers to hike interest rates. You can be proactive by paying all bills on time, and maintaining a healthy ratio of debt to credit limit to avoid being surprised by universal default. Choose issuers with no universal default clause. Citi, Chase and Capital One (recommended Capital One VentureOne rewards card) have dropped the universal default clause from their credit card agreements. Communicate with your lender. If your situation is through no fault of your own, explain the situation and plead for mercy. Negotiate for a workable solution. Practice good credit habits. Check your credit score each year and find ways to improve it. Use automatic transfers to ensure your payments will never be late. Cut back on borrowing and pay down debt aggressively. 0 Responses to "Credit card nightmare: universal default is alive and well"